In the latest news article on the Darwin Day dust up (see my previous post) there was a quote that caught my eye. 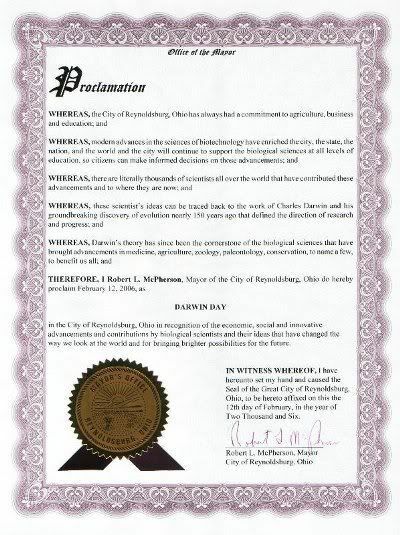 It seems that the former mayor of Reynoldsburg Ohio Robert McPherson said he didn’t remember signing a similar proclamation for a Darwin Day in his city in 2006. Well it seems there is proof that he did in fact issue such a proclamation. Whitehall’s consideration of honoring Darwin this year came after a a mass e-mail was sent to cities in November from the citizen group Darwin Day Columbus Planning Committee. Amy Birtcher, a board member of the Humanist Community of Central Ohio, put the group together. Birtcher said officials from a few other cities told her that they’d pass the idea along. Former Reynoldsburg Mayor Robert McPherson proclaimed Feb. 12 Darwin Day in 2006, although yesterday he said he didn’t remember doing it. I was there when the document arrived in the mail since I am a member of HCCO. We were shocked to get it because ironically some of our members had been complaining about McPherson putting up a Nativity Scene on the lawn of the city hall there and denying all attempts to add other symbols as required by various court cases around the country. This entry was posted in Anti-science, Entanglement, Politics, Religious Intolerance and tagged Charles Darwin, church and state, creationism, Evolution, Humanist Community of Central Ohio, science, science education, Whitehall Ohio on January 29, 2009 by Doug. The other day I posted a story about the conflict in the Whitehall city council about naming a Darwin Day to celebrate the 200th birthday of Charles Darwin, who developed the concept of Evolution. At a meeting on Tuesday, January 27th, the Darwin Day follies focused on actually naming a scientist to honor for the compromise “Science Month”. And then it got funnier. Councilwoman Jacquelyn Thompson originally suggested declaring Feb. 12 Darwin Day in honor of the 200th birthday of the man who conceived the theory of evolution. However, she watered it down to “Science Month” and added Galileo’s name in a compromise two weeks ago. “Is it fair to the hundreds if not thousands of other scientists to not name them?” Councilman Jim Graham asked. Council members suggested leaving a celebration of science to the schools and complained that it would compete with other February designations, such as Black History Month. 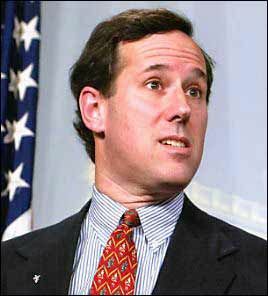 However, the unspoken issue revolved around who believed in evolution versus creationism. WOW! What a bunch of kooks. This entry was posted in Anti-science, Entanglement, Politics, Religious Intolerance and tagged Charles Darwin, church and state, creationism, Evolution, science, science education, Whitehall Ohio on January 29, 2009 by Doug. Whitehall Ohio is a 5.2 square mile enclave of Columbus. It is middle income town with the largest employer being a Defense Supply Depot. It also seems that some town leaders want to celebrate science ignorance. Back in December, Whitehall Mayor John Wolfe directed another episode of “Establishing a Religion” when he defended the city putting up a Nativity scene at city hall after complaints from the Freedom from Religion Foundation. Now it seems city leaders are against science. Her proposal faced heavy opposition last week, so she agreed to resubmit it as a resolution that would make February “Science Month.” However, the resolution — as read at the City Council meeting last night — still mentions Darwin. “I don’t think these are things City Council needs to be spending time with. It’s just a theory. There are other scientists,” Councilman Robert Bailey said. Once again, this opposition to Evolution and slander that it is just a “theory” is the result of ignorance of the concept. Evolution remains the foundation of biology, as it provides a unifying logical explanation for the diversity of life. If we continue to do nothing about celebrations of science ignorance as supported by Councilmen Bailey and Kantor, then this country will continue to fall behind in science. I don’t know about you but anything less than 1st place in science will not be cool. This entry was posted in Anti-science, Myths, Religious Intolerance and tagged Charles Darwin, Evolution, Humanist Community of Central Ohio, Ohio, science, Whitehall Ohio on January 21, 2009 by Doug. After 8 years of having religious ideology destroying Federal agencies and policies dependent on rational scientific thought and methods, President-elect Barack Obama said exactly what I wanted to hear. He appointed Steven Chu, a physics Nobel laureate, is his new energy secretary. Carol Browner, the former head of the Environmental Protection Agency, is the head of a new policy council to coordinate climate, environment and energy issues. And Lisa Jackson, the chief of staff for New Jersey’s governor, is head of the EPA. I am starting to feel better about the upcoming Obama years. This entry was posted in Media, Politics, Positive and tagged Barack Obama, facts, government, science on December 15, 2008 by Doug.